My Dad was a Freemason, just like his dad and his dad before that. 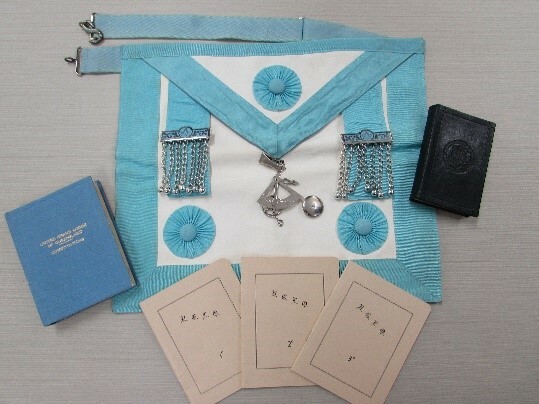 Back we go through the generations and various Lodge records held in Queensland, New South Wales, Ireland and Scotland that document the membership of my forebears for more than 150 years in this unique society once considered a Secret Society. Times have changed, and the Freemasons of Queensland participate openly within the community. Today they are known more for their charitable works than secret handshakes. Freemasons Queensland is part of a centuries-old tradition of helping men become the best they can be. Through self-improvement, support, leadership development and philanthropy, the Freemasons help influence lives for the better. In Queensland there are nearly 300 Lodges (independent groups with their own meeting places) around the state and despite many misapprehensions, it is not a religion, a cult or group of conspiracy theorists. 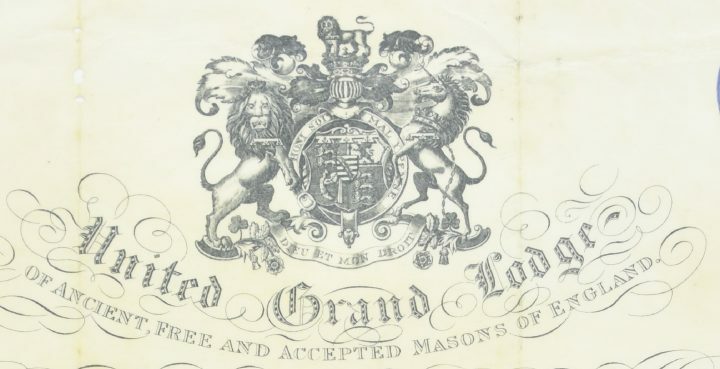 One of the unique Freemason records I’ve found in our collection was hiding away in the Intestacy file for Frank Dudley Beaumont. 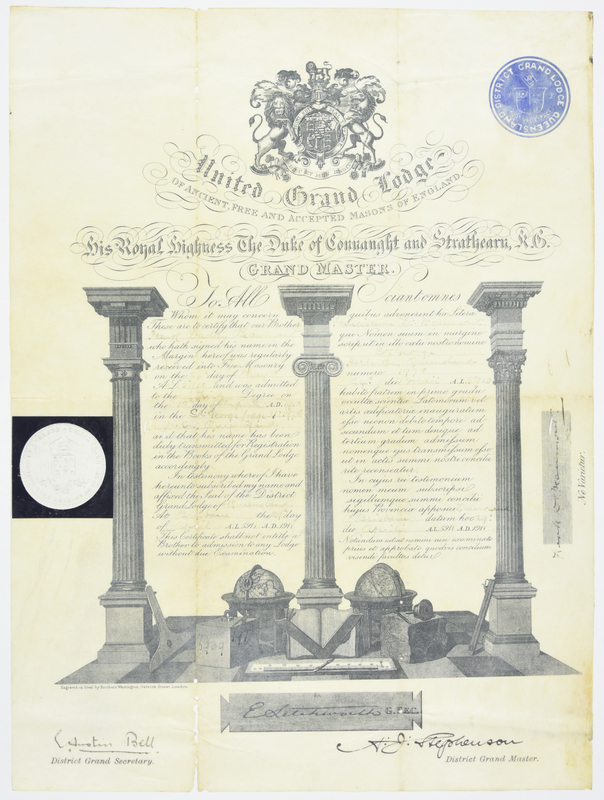 The Certificate is a beautiful parchment recording Frank Beaumont’s Admission into the 3 degree on 12 August 1920. He was a member of the St George Lodge at Herberton. Another find was in the Registers of Special Grants, 1861-1921. Under Section 16 of the Unoccupied Crown Lands Occupation Act of 1860 the Governor has the power to make grants or sales of any land for public purposes or for the public interest; so aside from Grammar Schools, cricket grounds, race courses, cemeteries and hospitals we find Masonic Halls are included. 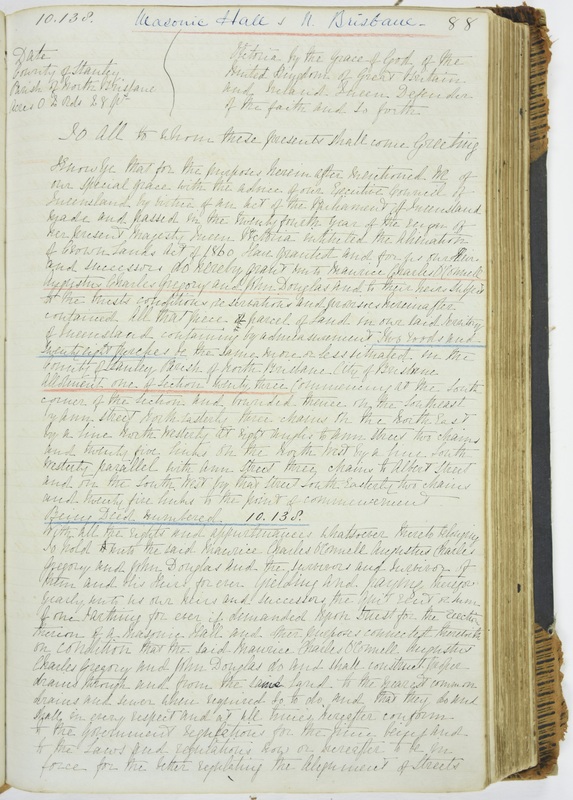 A Special grant for the Brisbane Masonic Temple in Ann Street [folio 88] shows that Augustus Charles Gregory of explorer and surveyor-general fame along with Maurice Charles O’Connell, notable public servant and later a famed politician, and John Douglas also a noted political leader of the era, applied for a special grant to erect the Masonic Hall in Brisbane. This was granted under Deed No 10.138 dated 15 Jan 1865. To check out more about the property this record covers see the Masonic Temple, Ann Street, Brisbane, This beautiful building is often open to the public during the Brisbane Open House weekend in October. But wait there’s more… Queensland State Archives also holds many photographs of the different Masonic halls across Queensland and early reserve files for these premises. 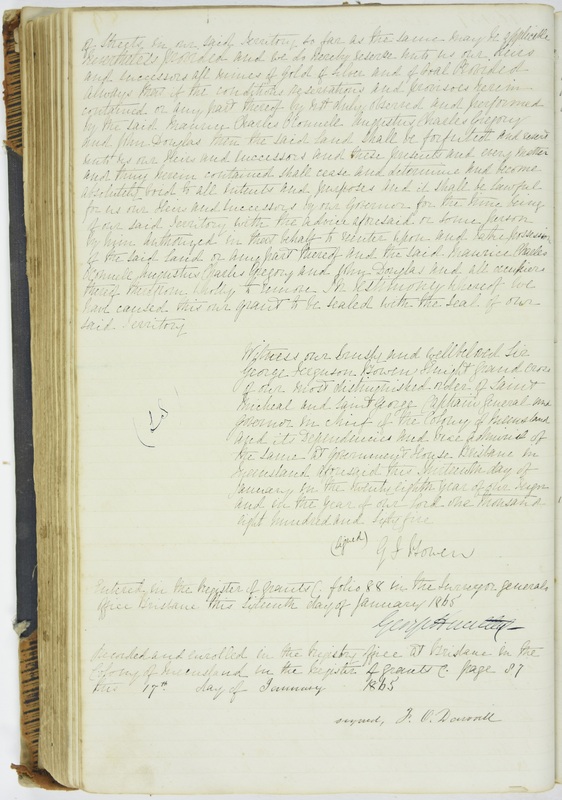 The earliest document held is the Reserve for the Masonic Hall, Deed of grant No 10138, Parish North Brisbane dated 11 October 1864. If you have an interest in the not so secret side of Queensland life come along and delve into the history of Queensland Freemasons at our place. We also hold records for other equally interesting community groups such as the Antediluvian Order of Buffaloes, Oddfellows Friendly Society, the Protestant Alliance and the United Ancient Order of Druids. Thanks for sharing D. Prosser.